I am so much more of a cold-weather girl. I love hot tea, fluffy doonas, boots and striped scarves. I live in jeans pretty much year round anyway but in winter it's actually justified! Of course the other thing to love about cold-weather is food that feels like a big warm hug. Unlike Summer when it gets so hot you lose your appetite and can't be bothered to cook. Ugh. My top 3 comfort foods (in no particular order) would have to be mashed potato dripping with butter, steamed pudding with custard and a good curry. I'm slightly devastated that my husband and kids haven't got the same love for mashed potato as I do - perhaps I overdid the mash when the kids were little! They of course love pudding though and luckily we all love curry, which is why we have one at least once a week. 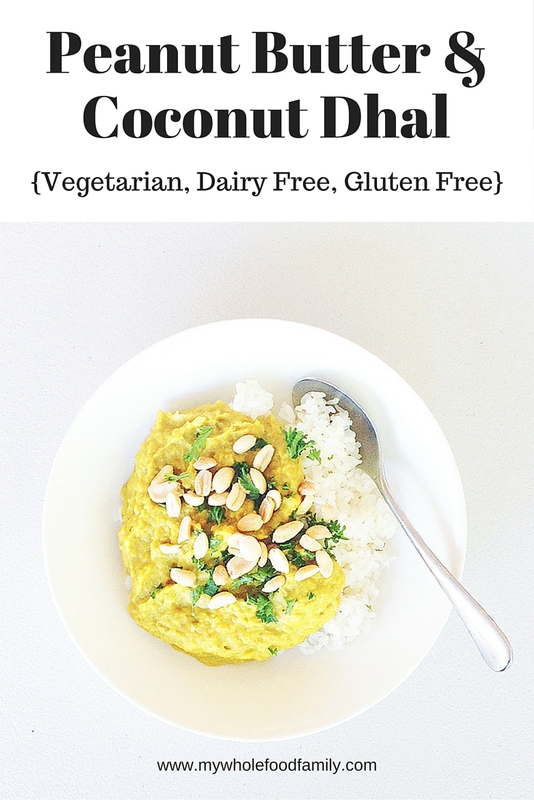 This coconut and peanut butter dhal was born of the desire to cut back on the meat a little and to broaden our curry horizons. Chicken korma, beef madras and curried sausages all feature regularly so it was time for a change. This is truly one of the most delicious things you can eat in Winter - warmly spiced, creamy and hearty even on the coldest days. Lentils are incredibly cheap and a great source of protein and fibre and they soak up curry flavours like nothing else. 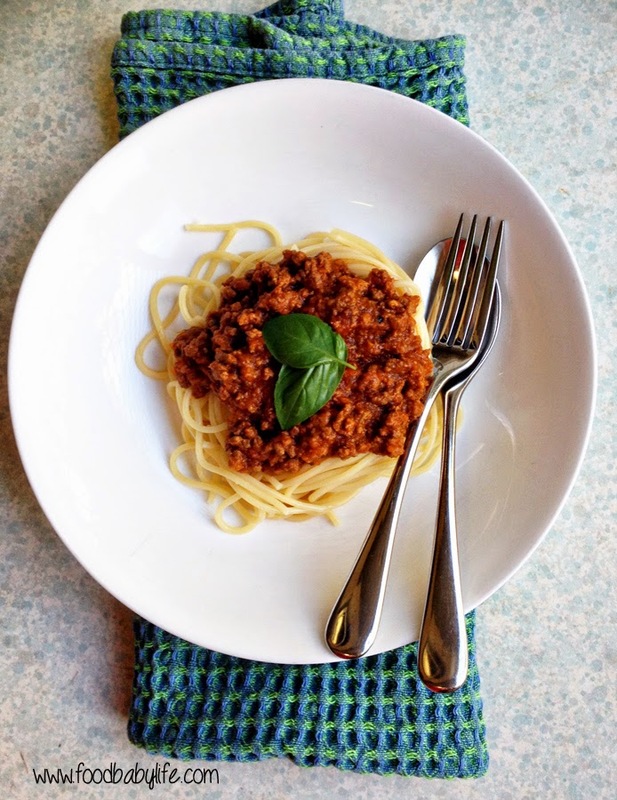 This was a huge hit as-is with the kids, but if you like it spicy you could definitely add some chili to taste. The dhal is quite soupy first made but turns into more of a mashed potato consistency the next day and it reheats beautifully with just a little coconut milk added. So in honour of Meat-free Monday, or just anytime you feel like a curry, why not give this one a go! Thermomix - place the onion, garlic and ginger into the mixing bowl and chop 4 seconds / SP 7. Add the coconut oil and salt and cook for 8 minutes / VAROMA / SP 1. Add all remaining ingredients and cook for 30 minutes / 100 degrees / SP 1. No Thermomix? Finely chop the onion, garlic and ginger then saute in a large pot over medium heat in the coconut oil until translucent. Add all remaining ingredients. Bring to the boil then reduce the heat and simmer for about 30 minutes or until the lentils are cooked through and the dhal has thickened. Serve with rice and greens, topped with roasted peanuts and some chopped fresh coriander. Delicious! 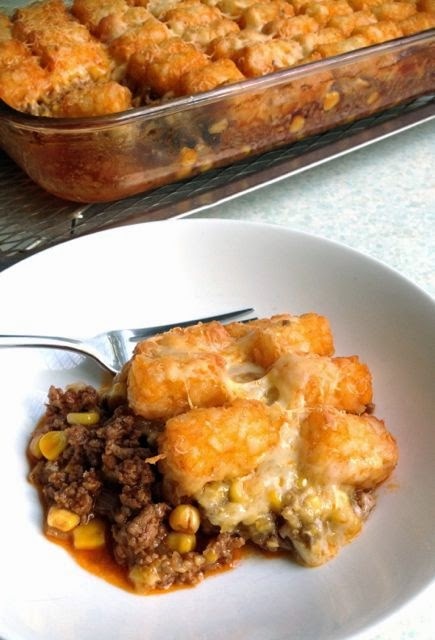 What's your ultimate Winter comfort food? I gave up dairy cold-turkey in December 2013 and honestly it was really hard. Not just giving up a food I loved, but the fact that dairy hides in so many foods that you wouldn't expect! It was the right thing to do for the sake of bub's reflex and dairy intolerance (and for my health too) but I was completely addicted to dairy and ate loads of it - milk, cheese, cream, ice cream, you name it. At first I just completely avoided it and didn't look for alternatives but as time went on, I started really missing the creaminess that only dairy gives. 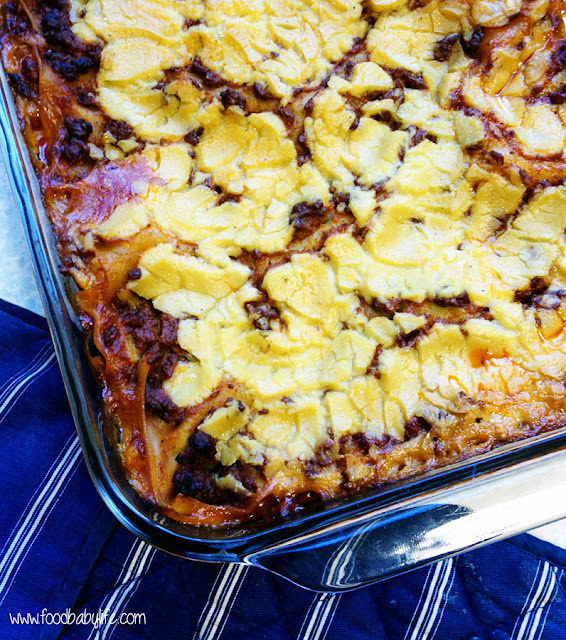 I perfected dairy-free ice cream and dairy-free lasagne a while ago, which brought macaroni and cheese to the top of the list. It's one of my husband's favourite meals and he has mentioned it often over the past few years. After a bit of experimentation, mac and cheese is back on the table! So while this is not exactly the same as the original it is creamy, full of flavour and has a delicious cheesiness from the nutritional yeast. 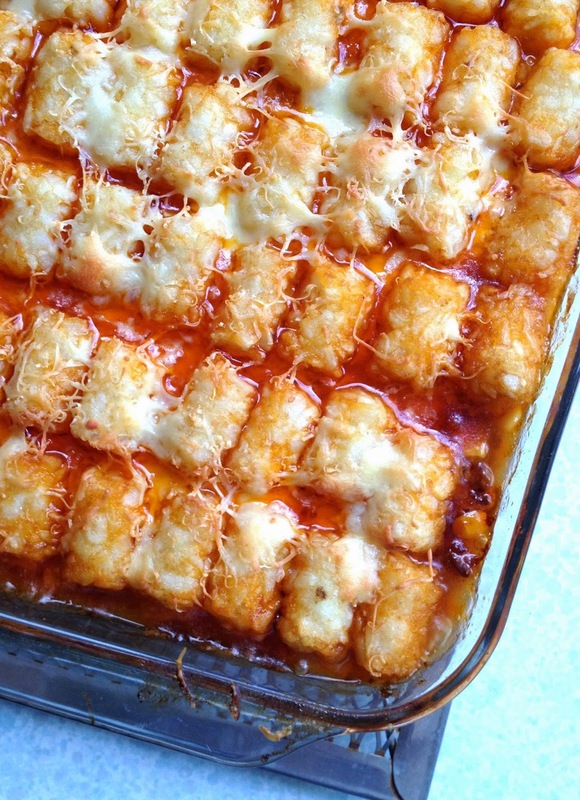 It is the ultimate comfort food and the kids will never know there are hidden veggies. We LOVE this dish and it's become a regular feature on our meal plans. If you're dairy free give it a go and let me know what you think! Put the water on to boil for the macaroni. Add the macaroni and cook as per packet instructions while the sauce is cooking. Place the sweet potato and pumpkin into the bowl and chop for 8 secs / SP 8 or until very finely chopped. Scrape down the sides of the bowl and add all remaining ingredients. Cook for 12 minutes / 100 degrees / SP 4. 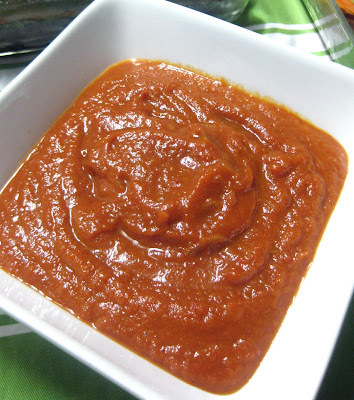 The sauce should be smooth but if it's not, puree for 30 secs / slowly increasing from SP 3 - 9. Drain the macaroni and return to the pot. Pour over the sauce and mix well. 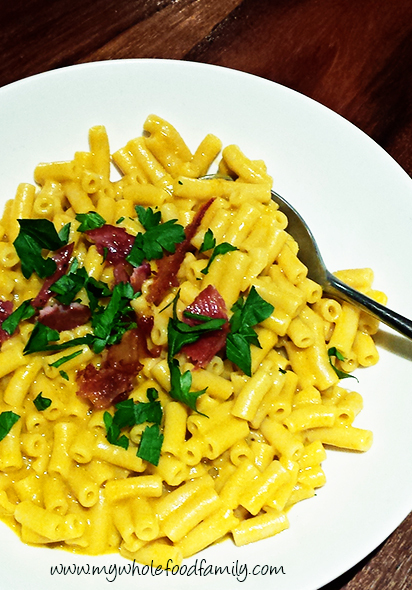 Serve topped with crispy bacon and fresh parsley. Well, where has June gone?? I didn't mean for the blog to become a ghost town this month but between exams and assignments and just daily life with 3 children I've been really stretched this month! 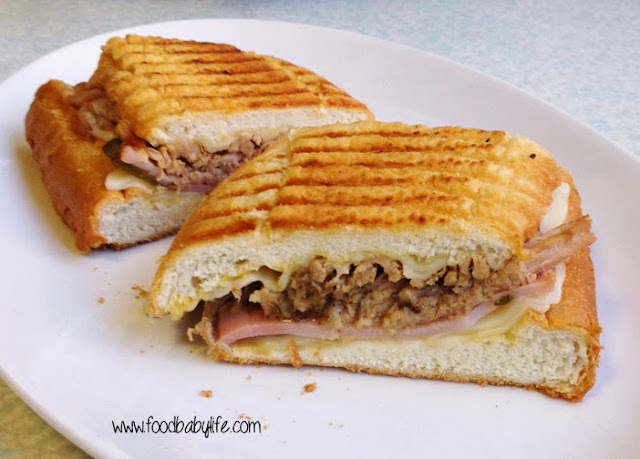 But there is no way I would miss out on my Secret Recipe Club post! Each month members are assigned a blog in secret to peruse and choose something to share on the reveal day. 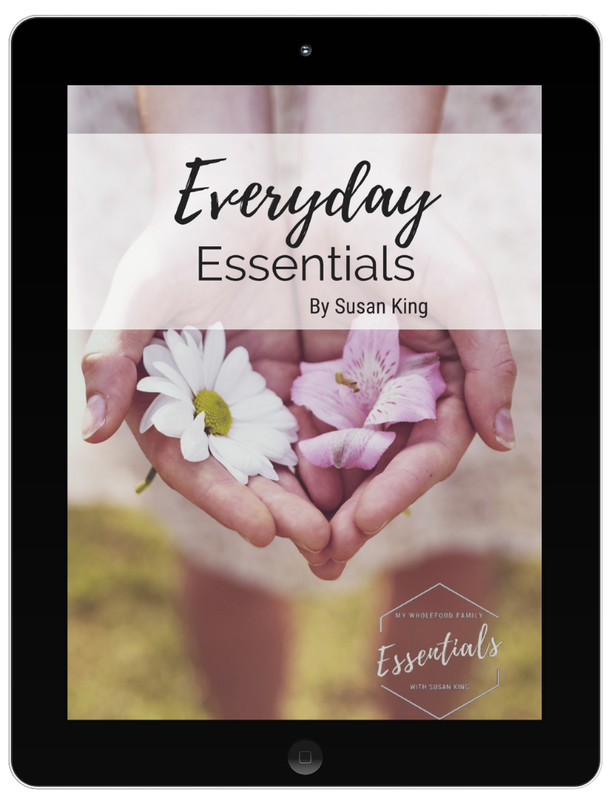 This is my second month as a member of Group C and I am loving discovering all these new blogs! This month I was assigned Where is my spoon? by Adina. Adina is Romanian but has lived in Germany for the past 10 years with her husband and 2 young children. Her recipes really reflect this European heritage and I spent many happy hours on her blog. There were literally dozens of very European recipes I would love to make - German Schnitzel, Transylvanian Yeast Cake and Linzer Torte just to name a few. But then I also loved her kid friendly recipes like homemade Chocolate Peanut Butter and the delightfully named Magical Soup for Children. 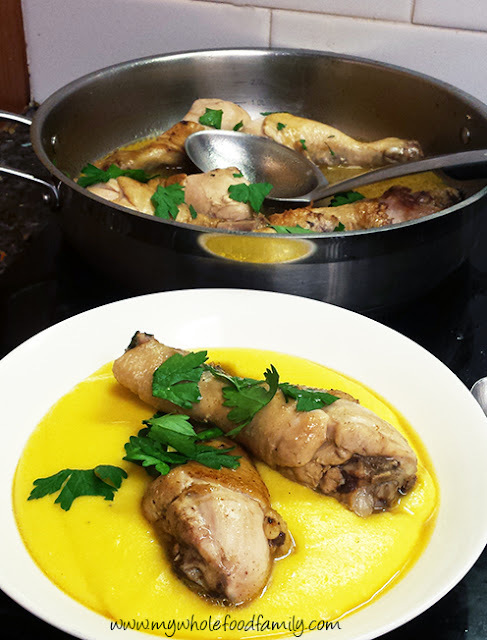 As Winter has finally arrived here I was looking for some serious comfort food and Adina's Garlic Chicken with Polenta ticks all the boxes. A simple but intensely flavourful meal, nothing fancy or complicated but so delicious that everyone is licking their fingers and asking for seconds. Adina describes it as a typical Romanian dish and something that her grandmother would have made. Perfect. These photos really don't do it justice (it was pouring rain and very dark) but this was SO DELICIOUS! I made a few small changes to the sauce, just reducing it down a little and cooking out the garlic a little more to suit my kids' tastes. I love simple food like this that when cooked with a little care become so much more than the sum of its parts. Slightly adapted from Where is my spoon? Heat the oil in a large, heavy based frying pan. Fry the chicken pieces until browned on all sides. Pour over the chicken broth, sprinkle on the paprika and half the chopped parsley. Bring to the boil then lower the heat and simmer with the lid on but just ajar slightly to let some of the steam escape. 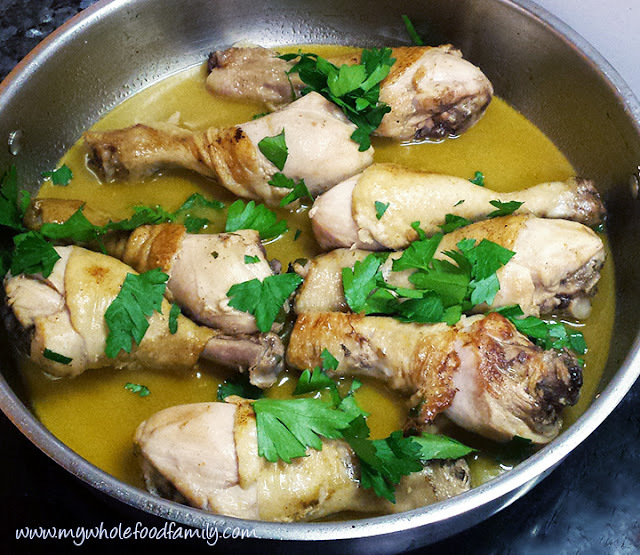 Turn the chicken in the broth several times while cooking for about 30 minutes or until the chicken is cooked through. Remove the chicken pieces to a dish and cover with foil to keep warm while you prepare the sauce. Add the crushed garlic to the pan, increase the heat and simmer rapidly with the lid off for about 10 minutes or until it has reduced by half. Add the butter and stir to combine. Strain the sauce through a sieve into a jug, then return the sauce to the pan along with the chicken pieces. Coat the chicken in the sauce, sprinkle over the remaining parsley and serve with polenta. Bring the water and salt to the boil in a large heavy based pot. Once boiling add the polenta in a steady stream, along with the oil and cook over low heat, whisking often for 30-40 minutes or until cooked through. 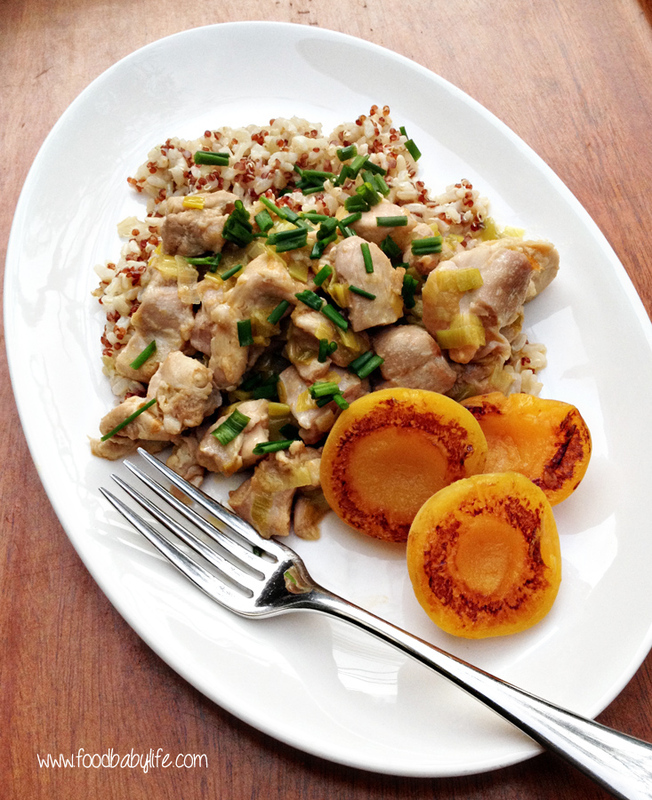 Thank you for a wonderful month, Adina – this recipe is a keeper! We're going retro with this one! 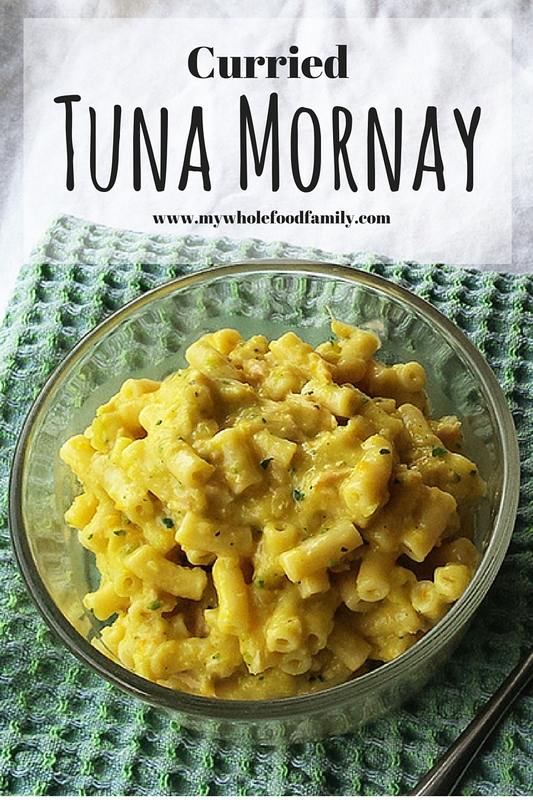 Is there anyone who didn't eat tuna mornay sometime growing up int he seventies or eighties? It was a staple at my house but mum always made it with canned cream of celery soup in it which is not something I choose to eat these days. (If you're interested Rachael Ray has a delicious homemade cream of celery soup recipe - it is loaded with dairy though - must experiment with a dairy free version!). I haven't made mornay for the kids for ages so it was high time to bring it back into the rotation. But before we get to the recipe, let's talk about tuna. 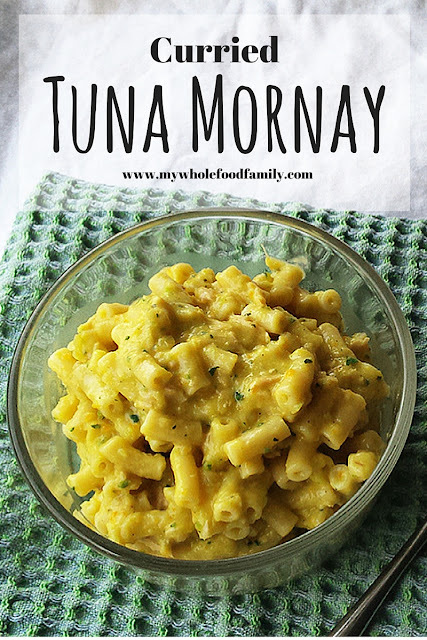 Do you have canned tuna in the pantry? And importantly, do you know how that tuna was caught? According to Choice there are 2 things to think about when buying tuna. You want to look for 'pole and line caught' tuna, which should be noted prominently on the label. Check out this Greenpeace guide to tuna brands in Australia. While I have never seen the number one pick (Fish 4 Ever), it is nice to see Safcol and Coles brand tunas rounding out the top 3. Are you surprised about which one is in last position? So check your pantry. What brand is your tuna? Have you ever actually read the label on a can of tuna? Oh and make sure you choose tuna in spring water, in order to avoid the vegetable oil most tuna is packed in. Because even the brands that mention olive oil on the front of the tin also contain a large proportion of vegetable oil. Yuck. Back to the mornay and I decided to mix things up a bit and add some curry powder. This was largely to please my curry-loving husband who also happens to hate 'mushy' food (and yes he would include tuna mornay in that category). Place onion, garlic, carrot and zucchini in mixing bowl and chop for 4 secs / SP 6. Scrape down the sides, add the butter and cook for 8 minutes / 100 degrees / SP 1 / measuring cup off. Add the flour, milk, curry powder and salt and cook for 6 minutes / 100 degrees / SP 1. Puree 20 secs / SP 8. Add the tuna and cook for 3 minutes / 90 degrees / SP 1 / Reverse. Mix through cooked pasta and serve. No thermomix? Prepare your sauce in a medium saucepan. Melt the butter and sauted the grated vegetables. Once tender, sprinkle over the flour and cook until it is dry, about a minute or so. Add the remaining ingredients, except the tuna, and cook stirring continuously for a few minutes until a smooth sauce forms. Add the tuna, turn down the heat to low and let simmer for a few minutes or until everything is cooked and warmed through. Add your pasta and enjoy! Do you have a favourite dish from your childhood? These smoky pork ribs were a seriously delicious dinner! I actually made these for Fathers' Day way back at the start of September and then with the move forgot to post them. Now there are probably thousands of rib recipes out there and I must have looked at dozens before deciding to just wing it and make something up myself. I didn't want anything too spicy and I didn't want to buy weird ingredients like liquid smoke. While I'm all for making things from scratch I did use bought sauces for this, namely the Fountain Good Choice tomato and barbecue sauces which I reviewed earlier this year. I wasn't able to find the American style ribs anywhere (admittedly I left it until the last minute!) 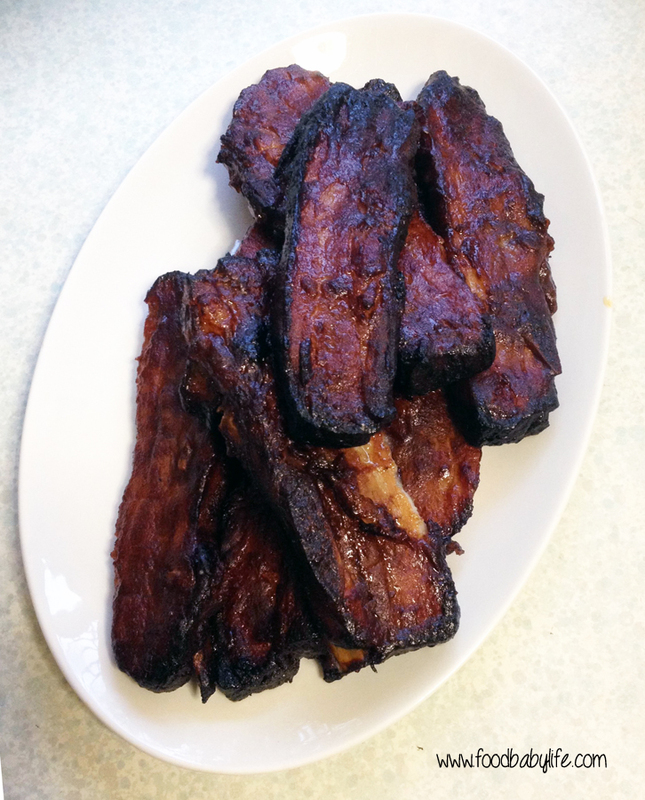 so used these Aussie pork spare ribs instead and they worked just as well. The cooking is done in three stages. First they are left to marinate in the fridge overnight which starts to tenderise the meat, then they are baked in the oven and lastly they are grilled and basted with marinade which makes them charred, sticky and luscious. So good! 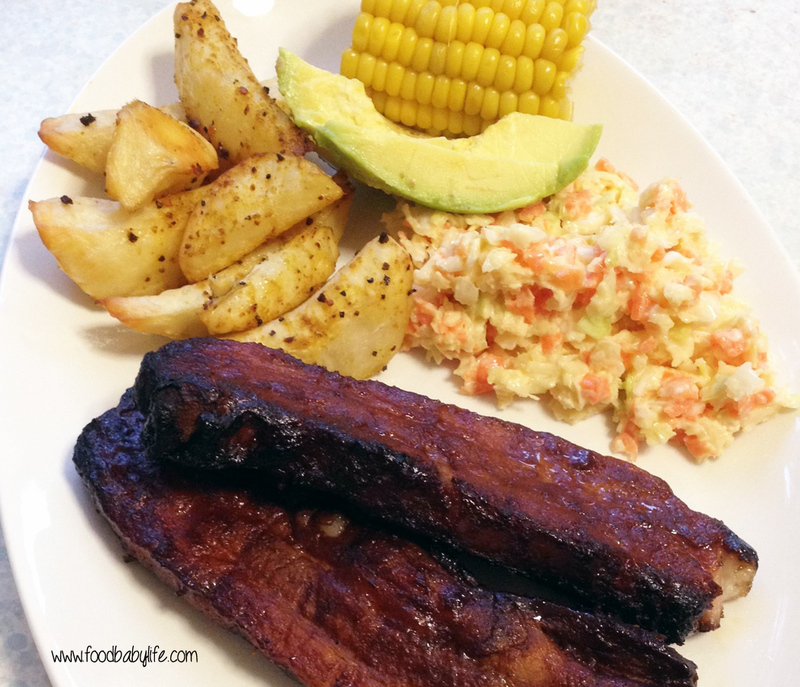 I served the ribs with coleslaw, avocado, homemade potato wedges and corn on the cob. Hubby and kids all loved it and there lots of sticky smiles and licked fingers. Remember to start this recipe a day ahead! Combine all marinade ingredients in a large dish and combine well. Add the pork and mix well, massaging the sauce into the meat. Cover the dish with 2 layers of plastic wrap and leave in the fridge overnight. Preheat the oven to 150 degrees celsius, Line a large baking dish with foil and place a rack on top. Lay out the ribs on the rack, reserving the marinade, season with salt and pepper and cover with foil. Bake for 1 1/2 hours, turning and basting with marinade every 20 minutes or so. Meanwhile tip the remaining marinade into a small pot and bring to the boil for a few minutes, until it has reduced and thickened. Increase the oven temperature to 200 degrees. Remove the cover from the ribs, brush with extra marinade and bake for another half an hour, turning and basting again halfway OR cook the ribs on a barbecue grill over a flame, turning and basting every 5 minutes or so (this will give best results!). Remove from the heat and allow to rest for 15 minutes before serving. One of my all-time favourite meals is lasagne. Always has been and probably always will be! It has also been a favourite of my kids and I have some gorgeous photos of each of them on their first birthday pretty much covered in it from head to toe! Now that they are older they get to choose what they want to eat for their birthday dinner and Oscar, bless him, still always choose lasagne. When I first had to give up dairy I really thought there was no way I could give up cheese. My husband used to call me a cheese-freak but now I haven't touched any for more than 18 months. Go me! After so many dairy-free months I have perfected my dairy-free white sauce and use it for all sorts of recipes from tuna mornay to macaroni and 'cheese' and of course lasagne. I use the thermomix to make it because it's just so easy but you can of course do it on the stove top and I have included those instructions as well. Go ahead and try it, I promise you won't miss the cheese at all!!! Thermomix - place all ingredients in the mixing bowl and cook for 7 minutes / 90 degrees / SP 4. Stove top - heat the oil in a medium saucepan over medium heat. Add the rice flour and whisk together. Cook for 2 minutes, stirring constantly then add the milk and whisk to combine. Once smooth add all remaining ingredients and cook over low heat for 5 minutes, stirring often. Use immediately. To assemble the lasagne just alternate layers of Vegie-loaded Bolognaise sauce with lasagna sheets (gluten free work well) and dairy-free white sauce ending with lots of white sauce on the top. Bake for approx 45 minutes at 180 degrees C or until the pasta is tender and the top is bubbly and golden. It's Secret Recipe Club time again and that means all my fellow Group Ds are revealing their chosen recipes today! This month I was really excited to be assigned Making Miracles by Rebekah. If you haven't checked out Rebekah's blog yet you really should because this woman is AMAZING! Rebekah has been a surrogate 3 times since 2006 (and currently on pregnancy #4) and started her blog to keep a record of her surrogacy experiences. Since then it has definitely evolved to include her own family and lots and lots of food! I love the names of her recipes too, it makes them really hard to resist - how about some Amazingly Easy and Delicious Ham and Potato Soup, Emergency Chicken or the Best Steak Marinade in Existence? I nearly went with the Bacon-Wrapped Potato Wedges but in the end though the Fantastic Cuban Sandwiches won me over not only because they sounded absolutely delicious, but because I remembered seeing the movie Chef last year (did anyone else see it? we loved it!) which was all about Cuban street food including the famous el sandwich Cubano! This is a super easy meal which takes only minutes to prepare and then the slow-cooker does all the work for you. I use my slow-cooker a few times every week so this was perfect for us. Every time I cook meat like this I wonder why I don't do it more often because it's just SO good! Tender, juicy and packed with flavour. The house smelt amazing all day while the pork was cooking and when it came the taste did not disappoint! I don't eat dairy and I did feel like I was missing out a bit without all that luscious melty cheese but it still tasted fantastic. We all loved these and even better, because I did such a big roast we had lots of leftover pork for lunch the next day and froze the rest for another dinner a week later. To prepare the roast, combine all marinade ingredients together and rub over the pork before covering well and leaving it in the fridge overnight. The next morning place in your crock pot on low for 8-12 hours (mine had about 10 1/2 hours and was perfect). To assemble the sandwiches, slice the rolls in half and spread a thin layer of the mustard and mayonnaise on the insides. Layer the cheese, ham, pickles and roast pork on one half. Top with another slice of cheese and then the other half of the roll. 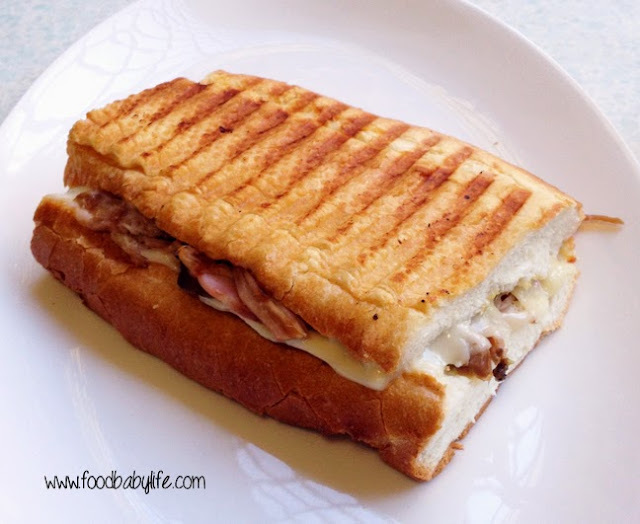 Press sandwiches in a panini press until bread is crispy and cheese is melted, about 3-4 minutes on medium-high heat. We go through lots of eggs in this house, at least 2-3 dozen or more if I'm doing lots of baking. We love them boiled, scrambled and fried. Turned into omelettes, quiches, custard and french toast. A quick flick through an old Woman's Weekly cookbook called Cheap & Cheerful and I came across a Kumara, Bacon and Egg Bake. We had everything on hand it was such an easy and delicious dinner! 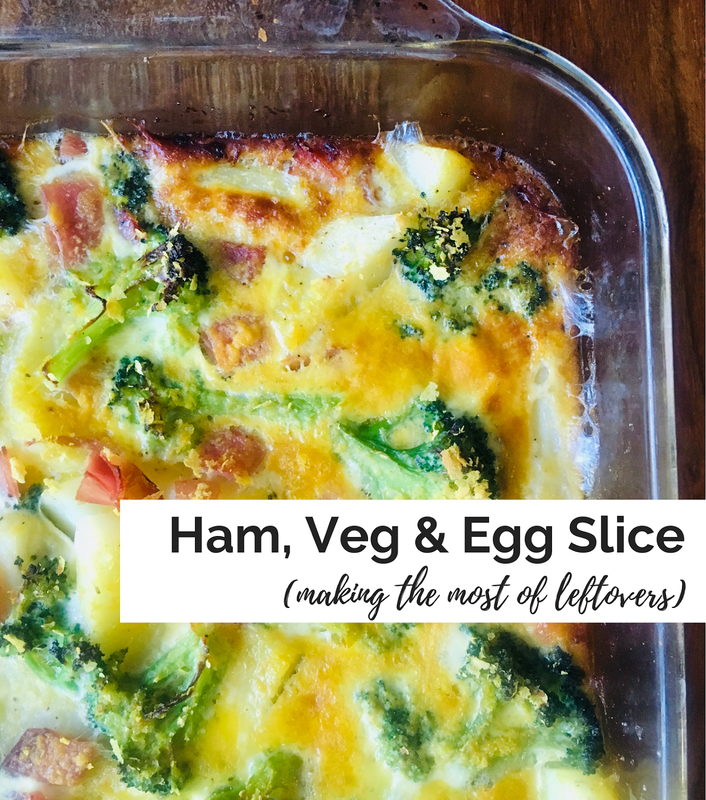 Itwas somewhere between a quiche and a frittata and would work really well if you happened to have some leftover steamed veggies in the fridge already. I used sweet potato and regular potatoes but really you could use anything you have. We had this for dinner but I think it would be a perfect brunch dish, especially as it could be prepared ahead of time and then popped in the oven at the last minute. Chop the sweet potatoes and potatoes into a 2-3cm dice and steam until just tender and then set aside to cool. Preheat the oven to 180 degrees / 160 degrees fan-forced. Grease a baking dish ( mine was 20 x 26 cm) with olive oil. Roughly chop the bacon and fry it in a pan over medium heat until just starting to crisp up. Sprinkle over the cumin and toss to combine. 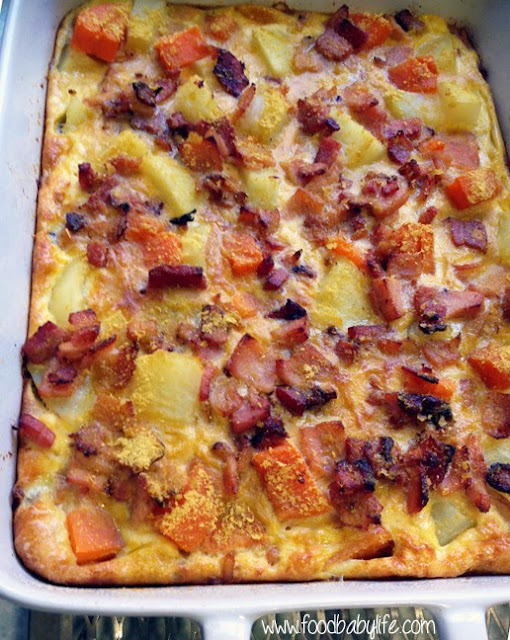 Spread the potatoes over the base of the baking dish and scatter the bacon over the top. Whisk together the eggs, milk and nutritional yeast in a medium bowl and then pour over the potatoes and bacon. Bake for 30 minutes. Serve warm or hot with a green salad. This was a really delicious dinner so I hope you can look past the horrible photo! We are having a run of very cold weather at the moment and as a result we're all looking for comfort food. 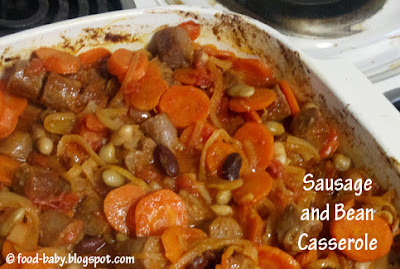 This casserole is an easy weeknight meal and with sausages, beans and rice it fit the bill perfectly. I feel a little ridiculous putting my copyright info on a such a bad photo but I recently discovered that not one but two lowlifes had stolen virtually every post and photo from my blog. It's taken a little while but both blogs and the other sites where they had used my stolen content seem to have all been taken down. I actually feel quite violated by the whole experience. Anyone else had this problem? How do you protect your work online? Anyway. You can see that comfort food is most definitely required. Preheat oven to 180 / 160 degrees celsius fan forced. In a large fry pan fry off the sausages until mostly cooked. Remove and place into a 3 litre casserole dish and once cool enough to handle, slice into 2cm rounds. In the same frypan add the onion, garlic and carrot and cook, stirring frequently until the vegetables are beginning to soften. Add the tomatoes, beans, water, mustard, brown sugar and worcestershire sauce. Stir until well combined. Bring to the boil, season to taste and then add to the sausages. Mix well to combine then cover and place in the oven for approx 45 minutes, or until the vegetables are cooked through and the sauce has thickened. Serve with rice or crusty bread for a hearty winter meal. 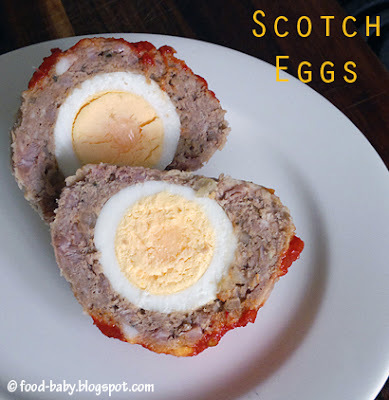 So Scotch Eggs are pretty retro. I remember them from childhood dinners but I had never attempted them before, partly because I was put off by having to deep fry them. Luckily there are an abundance of baked versions out there. I took a photo of this recipe from an old Better Homes and Gardens magazine and then promptly lost all other details. The verdict? Really tasty! The kids loved the surprise egg in the middle and I loved that they tasted just as good cold from the fridge the next day. Perfect for school lunches or a picnic. I guess some things are a classic for a reason! Preheat oven to 180 / 160 degrees celsius fan-forced. Lightly grease a baking tray with oil spray and set aside. In a large bowl add the mince, bacon, onion, garlic, oregano and sauces. Add some freshly ground black pepper and mix well to combine. Use your hands for best results. Divide the mixture into 6 equal portions and roll each into a ball. Using wet hands, flatten out each ball into a large patty, place the egg in the middle and wrap the mince patty around the egg, making sure it is completely enclosed. Repeat with remaining mince and eggs then roll each of them in breadcrumbs and place on the baking tray. Bake for 20-25 minutes. Serve hot or cold. We have recently discovered a super butcher near us (literally called Super Butcher) where they have wonderful quality meats like wagyu roasts at great prices. A few years ago I could have easily become a vegetarian but I've since discovered a taste for red meat. We have had the most amazing grilled steaks, pork belly and roasts I've ever eaten and they all came from the super butcher. On the menu tonight were Black Angus beef sausages and I was looking for some way to spice them up a bit. This recipe falls into the always-wanted-to-make-but-never-got-around-to-it category. 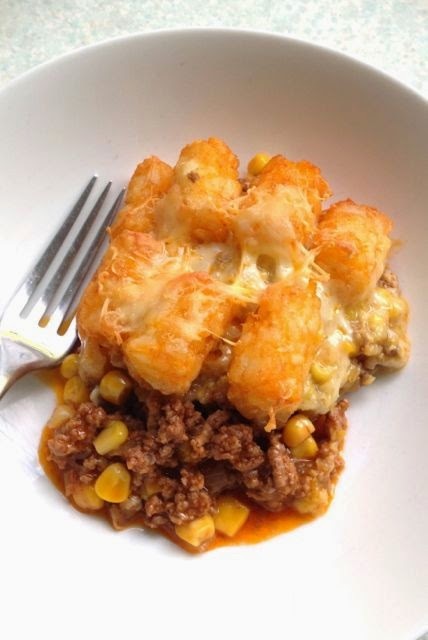 I think most of us have a list like that and while a lot of wishlist recipes tend to be extravagant, expensive or just downright decadent, this was a great addition to a weeknight meal. I know there are a million other bbq sauce recipes out there, some sweeter, some hotter, some that take days to make in a slow cooker ... but this was perfect for us and I will definitely be making it again! Place the oil in a saucepan over low heat, add the onion and cook for 5 minutes until softened slightly. Add all the other ingredients and bring to the boil. Reduce heat to medium and cook for 5 minutes, stirring, until thickened slightly. Set aside to cool slightly. Place in a blender and blend until smooth. Store in an airtight container in the fridge for up to 2 weeks.